So I’m in love. 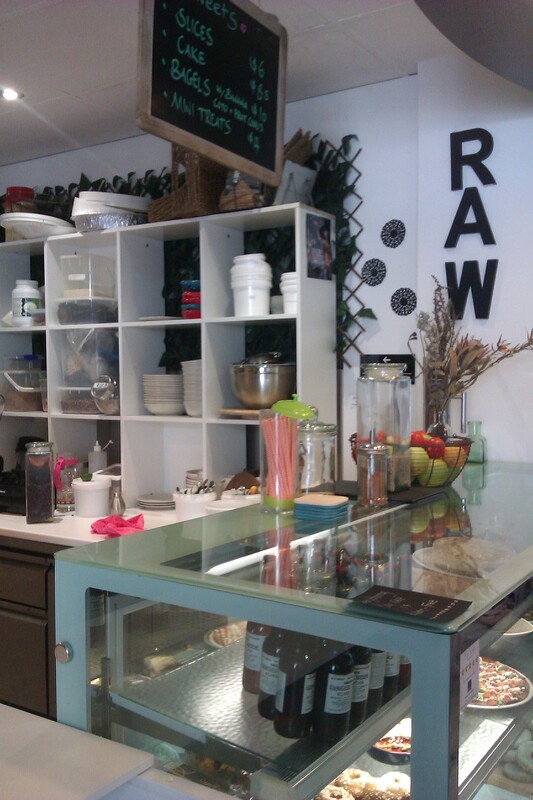 I love raw food places because you can feel the care in the food. I’m serious! Nothing can be “slapped together” in a raw food cafe because everything is a process- blending, chilling, dehydrating, marinating, etc. Orawgi (meaning Organic, Raw and low GI) is run by the supremely talented Jamie Louise Stevenson. I like to think her parents read her Treasure Island as a child. It’s actually located inside another building- BioSolar- on Ipswich Road in Wooloongabba. Their Facebook page is here and the owner also runs the yoga studio next door. The decor is white and bright but a lot of fun. I forgot to take a picture of the wall that was just black and white photo frame wallpaper with the staff’s colour photos stuck on it, but it was very cute. There were quite a few people there and the three staff were bustling and busy. Ethics is the name of the game here. Everything is vegan (except for honey in smoothies) and organic and made in the store. It’s not cheap, but when you consider the labour that goes into making an organic dehydrated pizza base or quiche or bagel, it’s worth it! 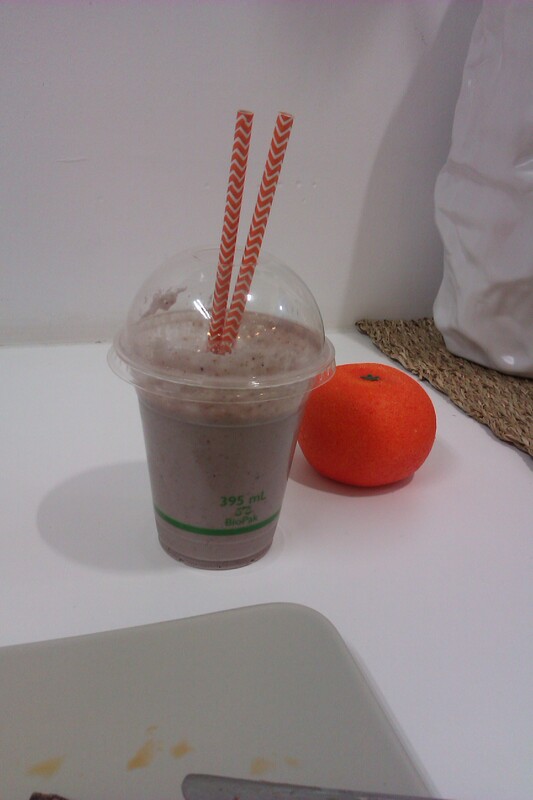 Take away containers are biodegradable and non-plastic wherever possible. 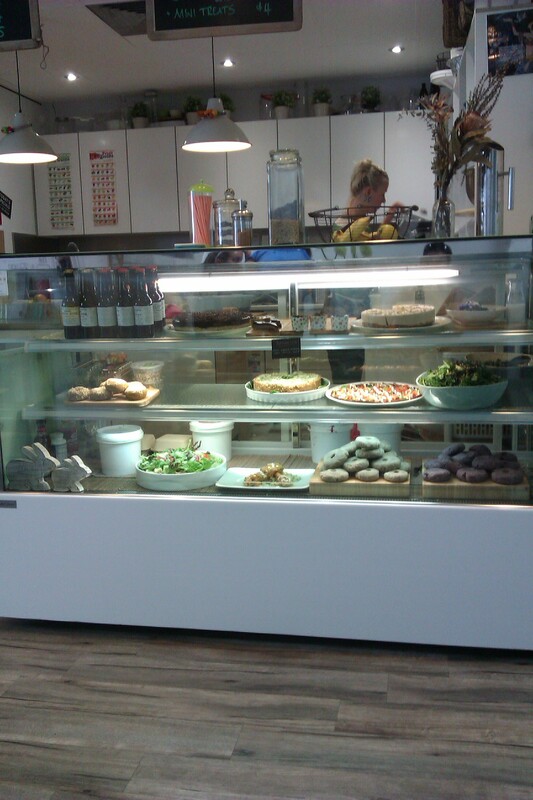 I oggled the display cabinet but decided upon the pizza straight away. I think most of the meals were $15 but a lunch deal is $20 and includes either a drink or something sweet. I ordered The Jefferson Special smoothie (walnuts, protein powder berries and honey) with my lunch and it also came with salad. I had the garden salad and the kale salad (although you can just have one or the other if you want). This might not look like a huge serve, but I was FULL by the time I’d finished. The salads were tasty- the kale one had purple carrots and a Asian soy-ish flavoured dressing with lots of sprouts and seeds. Fresh. How do I describe raw pizza? Hmmm… well the veggies included tomato, capsicum and florets of broccoli (trust me when I say that broc on a pizza can work!) on a crispy base. The base is made from nuts that are made into a “dough”, rolled thin and then dehydrated (dried without cooking) until crispy. The sauce was amazing- it tasted like sun-dried tomatoes and perhaps capsicum buzzed up in a Vitamix blender until super-fine and smooth. There was also a drizzle of cashew sauce- cashews, garlics and I’d have to guess perhaps some nutritional yeast- which serves as the “cheese”. 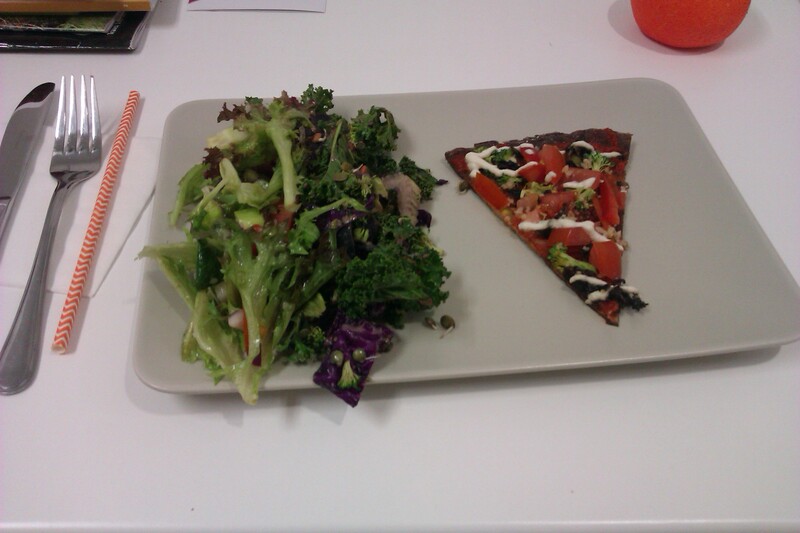 This is not Dominos people, this is nutrient dense food that tastes great. 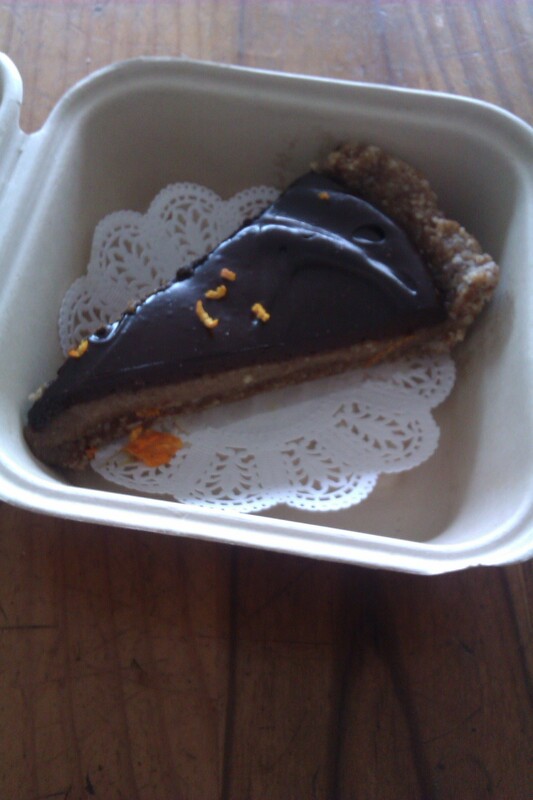 I also ordered a brownie to take away but they were all out so I had the chocolate and salted caramel tart. It’s a hard life. Even though it has coconut oil/butter in it, it lasted all the way home via the fruit and veg shop without turning into a gloopy mess. I don’t know what I liked more: the base or the toppings. Can you marry a shop?